At the end of 2014 the total deposits in the banking system amounted to PLN 914.5 billion, i.e. by 8.1% more than at the end of 2013. Deposits held for households stood at PLN 591.6 billion. 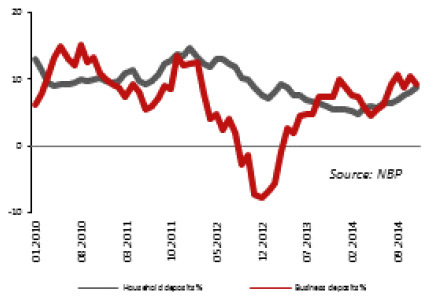 In 2014 deposits held of households regularly increased and in December reached 8.8% year-on-year (versus 5.6% in December 2013). The deposit growth being higher than in the prior year resulted mostly from an improvement on the labor market, while interest rate reductions by National Bank of Poland adversely affected the attractiveness of investments in the banking sector. In December 2014, deposits of enterprises amounted to PLN 225.9 billion, i.e. increased by 9.4% during the year vs. 10.0% increase in December 2013. 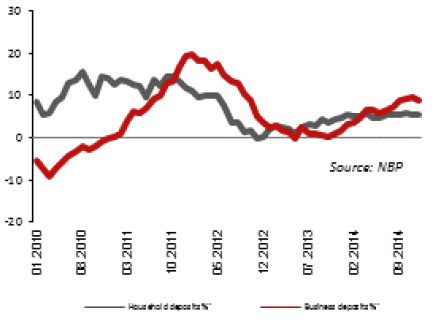 A slight slowdown in the growth of corporate deposits resulted from a significant increase in their investment activities. In December 2014, loan receivables in the banking sector totaled PLN 1,005.7 billion, being 7.3% higher than in December 2013. Loans and advanced to households went up by 5.5% up to PLN 593.2 billion. Housing loans in the local currency grew from PLN 170.3 billion in December 2013 to PLN 190.6 billion (i.e. by 11.9%) at the end of 2014. Record low interest rates and an improvement on the labor market positively affected the scale of the new lending campaign. Effective date of the more restrictive Recommendation S falling in 2014, disallowing among others loans funding 100% of real property value was an adverse factor. Mieszkanie dla Młodych (Apartment for Young) program commenced as of 1 January 2014 did not materially affect the lending campaign. The portfolio value of foreign currency loans dropped to PLN 162.2 billion, i.e. was by PLN 3.2 billion lower than at the end of 2013. The decrease in the portfolio value resulted on the one hand from changes in PLN exchange rate, and on the other hand, from the minimized availability of foreign currency loans pursuant to implementation of the more restrictive Recommendation S. Receivables of the banking sector due to consumer loans from individuals increased. In December 2014 they totaled PLN 144.1 billion (versus PLN 138.4 billion in December 2013). The consumer loan volume increase resulted from a reduction in interest rates and more lenient loan terms offered by banks, among others in relation to the observed labor market improvement. In December 2014 the value of loans granted to enterprises was PLN 298.5 billion versus PLN 274.6 in December 2013 (8.7% growth). The clear speed up of the lending campaign in the enterprise sector resulted from an increase in investments made by this sector. Attractive interest rates were among factors encouraging investment loans. In October 2014 Monetary Policy Council reduced interest rates. The reference rate was reduced to the lowest level in history (i.e. down to 2.00%), while the lombard rate to 3.00%, which materially affected the interest rates on loans and deposits, in particular in Q4 2014. According to the data of the National Bank of Poland, in 2014 the average interest rate on new deposits of households in PLN amounted to 2.31% versus 2.59% in 2013. Average interest on new deposits of enterprises amounted to 1.92% as compared to 2.32% in the previous year. Average interest on new loans granted to households in the Polish zloty in 2014 stood at 7.36%, having dropped by 1.84 p.p. versus the end of 2013. As for loans for households, the interest on housing loans amounted to 4.70% (versus 5.16% at the end of 2013), and interest on consumer loans reached 9.45% (13.05% at the end of 2013). In the business sector, the interest on new loans in the local currency amounted to 3.54% at the end of 2014, while in 2013 it was 4.43%. An increase in the balance of allowances and provisions, resulting mostly from a growth in allowances for consumer loans, other household loans and an increase in allowances on non-financial assets and the scale of recognized provisions. On the other hand, allowances for receivables from the business sector accompanied with an IBNR (incurred but not reported) gain were observed. The share of impaired receivables in the total receivables from the non-financial sector dropped from 8.5% in December 2013 to 8.1% at the end of 20142. 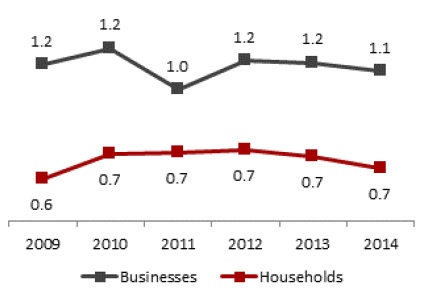 The year 2014 also saw an improvement in the quality of credit exposures of banks to enterprises and households. Following allocation of a portion of profits for dividend payment and successful lending campaigns, the solvency ratio of the domestic banking sector dropped from 15.7% in December 2013 to 15.3% in December 2014. At the end of 2014, Tier 1 ratio was 13.8% (13.9% the year before). Banks continued with measures aimed at efficiency improvement through optimization of headcount and sales networks. As a result, a medium headcount drop in the banking sector was observed (by 1.6 thousand people) and a reduction in the sales network (by 243 outlets). 1 Source: PFSA, Monthly data for the banking sector, December 2014. 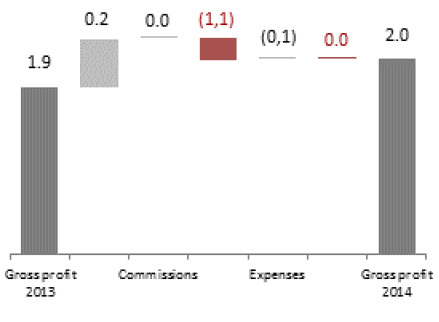 2 Source: NBP, Section:Financial data for the banking sector, file Receivables.